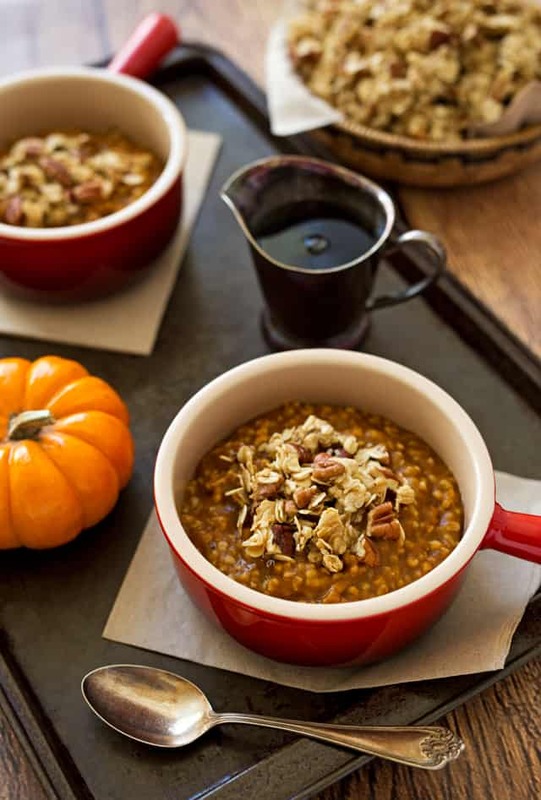 Pressure Cooker Pumpkin Steel Cut Oats topped with a sweet, buttery pecan pie granola. A fiber filled breakfast made with pumpkin and warm fall spices. My four-year-old grandson is crazy about steel cut oats and asks my daughter to make it for breakfast often. Recently my daughter sent me an email. So Evan requested steel cut oats again, so I switched out the cinnamon in your apple one for pumpkin pie spice, and now I’m daydreaming of fall flavored oatmeal. Like pumpkin and chocolate chip or craisins. And pecan pie steel cut oats. Can this be a thing, mom? Pumpkin in October and Pecan Pie in November? Sounded like a great idea to me. So I set out to create the recipes. 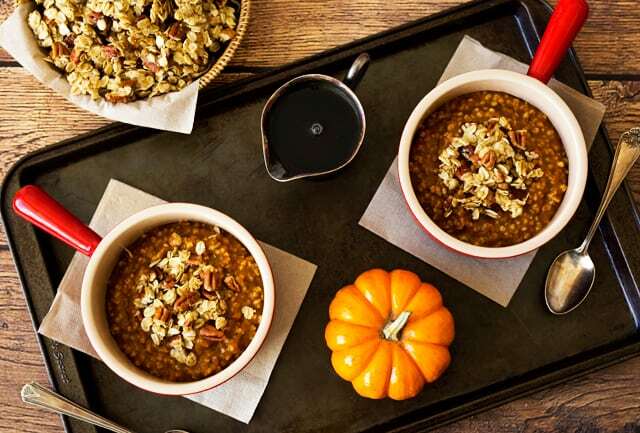 The pumpkin steel cut oats recipe was pretty straight forward to create. I just transformed my pressure cooker carrot cake oatmeal in to a pressure cooker pumpkin oatmeal. The pecan pie steel cut oatmeal was more of a problem to create because pecan pie isn’t flavored with spices. It’s just luscious, sweet, gooey pecans in a crisp crust. I decided instead of creating pecan steel cut oats to create a sweet, buttery, crispy granola to top the pumpkin steel cut oats. My daughter is crazy about my granola and I know she and my grandsons are going to love this Pressure Cooker Pumpkin Steel Cut Oats with Pecan Pie Granola. The Pecan Pie Granola recipe is on Barbara Bakes. Add water, pumpkin puree, maple syrup, cinnamon, pumpkin pie spice, and salt. Select high pressure and 10 minutes cook time. Stir oats. Remove cooking pot from the pressure cooker and let oats rest in the cooking pot uncovered for 5 - 10 minutes until oats thicken to desired consistency. Serve warm with pecan pie granola, milk and maple syrup if desired. Also got the burn warning. Tried scraping pan and adding a bit more liquid and got the burn warning again. Ended up dumping out into pot and finishing on stovetop. Hi Ang – what brand of steel cut oats are you using? I have the same problem in an 8 quart. Sometimes it comes to pressure, sometimes not. When it works, it’s delicious! 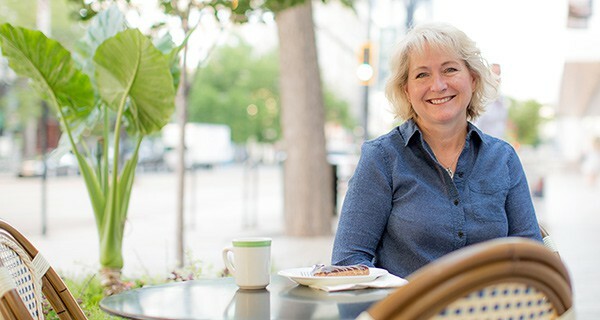 Hi Ann – what brand of steel cut oats are you using? Have you used a different brand when it works and when it doesn’t? Have you tried adding additional water? I use Trader Joe’s steel cut oats. I will try adding more water (maybe 1/2 cup to a cup) and see if that helps. Thanks so much for your speedy reply! Hi Ann – thanks for the update. Are the Trader Joe’s steel cut oats quick cooking? What’s the cook time listed on the package? Thanks! They’re not quick cooking, 35 minutes cooking time. My instant pot sealing valve never closed. Steam was rising the whole time. Is this normal? was the valve turned all the way to Steam? No, your pot should seal up normally. I had the same problem – I’ve tried making this on two separate occasions and the valve never closed so it never sealed and came to pressure. I made different recipes without a problem. I think that the pumpkin is so thick that it doesn’t act like a normal liquid. I’m surprised that more people haven’t had this issue! Sorry you had problems Jen – 3 cups water and 1/4 cup maple should be plenty of liquid to come to pressure. It makes me wonder if it was a problem with the gasket or valve. Did you stir the ingredients after adding? Hi Jen – yes, you can double it, but be sure and use a natural release for at least 10 minutes so you don’t get foam coming out of the valve. Cac this oatmeal be frozen or refrigerated for future use. I am the only one in my house that eats breakfast. Hi Gari – yes, it keeps well in the refrigerator or freezer. Thanks for this recipe. I just purcased stove top pressure cooker thought it’s not my first one – just been years. Unfortunately, it did burn in a few spots, despite having followed recipe and stirring before. I didn’t use high heat. So, I guess this is better in an electric version. I was thinking all recipes were convertible either way. I do love the concept, though – andwill try again in the right scenario. I’m thrilled with your site and looking forward to trying out other recipes. This failure was on my part, not your recipe. Thanks JoJo – I’m so glad you’re enjoying my site. 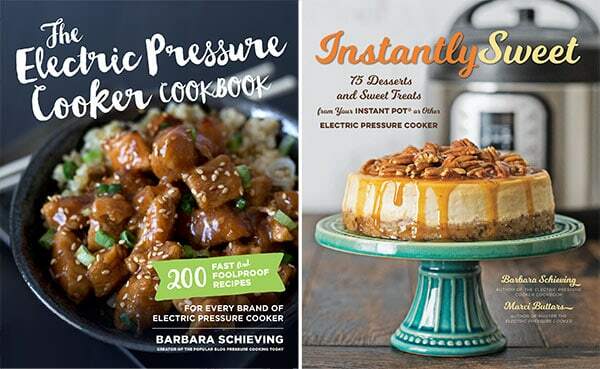 Since the electric pressure cookers regulate pressure themselves, often there is less evaporation, so you may just need to add more liquid. Stove top pressure cookers also cook at a higher psi, so you could reduce the cook time a minute or two. I made the granola last night and made a few substitutions: coconut palm sugar for the brown sugar and a combo of honey and maple syrup for the corn syrup. It is delicious! This morning is made the pumpkin steel cuts oats and boy did my house smell great! Thanks for two more outstanding recipes!!! 1) Thanks for this AMAZING recipe! It was a wonderful way to start off our Sunday morning! I definitely scored brownie points with the wife on this one! She said it was undoubtedly one of the better breakfast she’s had in quite some time! Being that I have leftovers, might it be possible to freeze so that I can rack up more brownie points with the wife? 2) The Pecan Pie Granola was “heavenly” says the wife! She loved it. When I made this, I used a stand mixer and followed the directions accordingly. After completely mixed, I placed it in a 9 X 9 pan on parchment paper. I baked it at 300 for 20 minutes and it turned out crusty on top. I put it in a sealed container and today, I found it to be moist. I wonder two things: 1) can I place it on a cookie sheet and place it back in the oven to “bake” and “dry” more? 2) What is the optimal cookie sheet or pan to make this the next time? Thanks again for a WONDERFUL recipe! You’ve knocked it out of the ballpark! 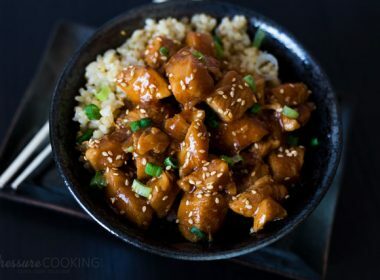 Another recipe which we use OFTEN is the Spicey Honey Garlic Chicken. It’s a favorite in our home and friends have asked for it. Thanks! What a sweet comment. So glad the recipes were a big hit! I live in a dessert climate, so that may account for the difference more than the baking sheet. I’m sure you could just bake it again to crisp it up. Just keep an eye on it and don’t let it burn. Next time you could try a longer bake time as well if you feel like the bottom isn’t crisp enough. Thanks for your reply Barbara. I’ll try that. I’ll put it back in the oven and let it bake longer, checking it from time to time. In the meantime, any thoughts as to freezing the leftover oats? I often freeze steel cut oats in single serving portions 🙂 Then I microwave it when I’m ready to eat it. Just add milk or water to the desired consistency. Oh, man, you’re pushing oatmeal up to a whole new level! I can’t wait to see your pecan pie granola! Thanks Liz! I know you’ll love it. 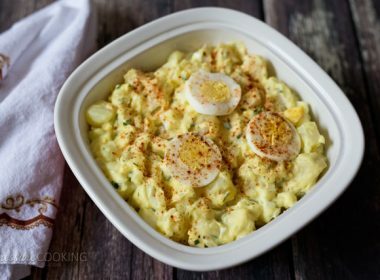 Oh my goodness, I am all over this recipe! This looks wonderful and I can hardly wait to try it! Thanks Barbara! Thanks Mary! Hope you love it as much as we did. This sounds so good! Can I pressure cook rolled oats instead of steel cut oats or will they be too mushy? Thanks Robin – I haven’t tried it with rolled oats, but I assume it would work just fine. You would reduce the cook time though. Maybe only a minute or two. my daughter and I love steel cut oats in the pressure cooker. 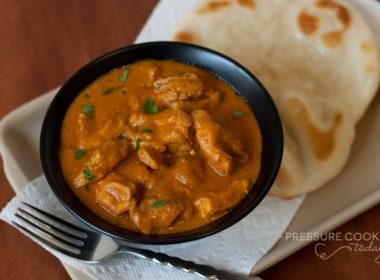 In the past years we’ve cooked it in a rice cooker (ah,…no) stove top where you bring it to a boil and let it set to continue cooking in the morning and in a slow cooker overnight. 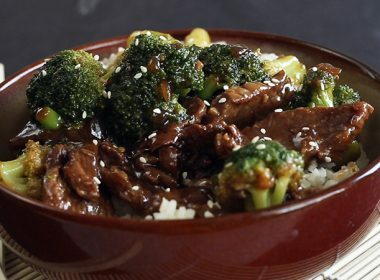 The pressure cooker won hands down for simplicity, ease and texture. Looking forward to your pecan granola as that is my sons preferred method of his oats! Thank you for all your hard work testing all these recipes and then giving us the short cut after all your efforts! Not sure why I’m missing it, but I cant seem to find the recipe for the pecan pie granola? Is it just my phone hiding it from me? Hi Kelly – I’m actually posting the granola recipe on Barbara Bakes on Friday. If you want to make it before Friday, just email me at barbarabakes@gmail.com and I’ll email it to you. Thanks! 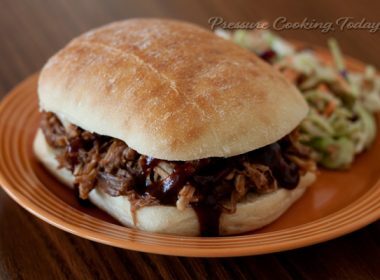 Wonderful Halloweenish recipe for a pressure cooker!